Despite being in the general area of Morrowind, the climate of Solstheim is more like that of Skyrim. According to Nord legend, it was originally a part of the mainland until a titanic battle between two Dragon Priests, the Guardian and the Traitor, ended in Solstheim being sundered from the rest of Skyrim in the Merethic Era. The Traitor, Miraak, had turned on his dragon masters under the influence of Hermaeus Mora and fled to Solstheim. The Guardian, Vahlok the Jailor, fought with Miraak, and the Dragon Cult burned his temple to the ground. Miraak escaped their vengeance by retreating into Apocrypha. The Dragon Cult then ruled over Solstheim until the time of the Dragon War, when the Nords rose up against Alduin's tyrannical rule. The Skaal, an offshoot tribe of Nords, are known as the "heirs of the Guardian", and may have come to the island at this time. Like on the mainland, the Nords shared the island with the native elves. The final stand between the Nords and the Snow Elves took place on Solstheim, at the Battle of the Moesring. The Snow Prince was killed during the battle and the elven forces were routed, leading to the ultimate collapse of Snow Elf society. The Dwemer also once had a presence on the island, until the Battle of Red Mountain in 1E 700 led to the disappearance of the entire race from Mundus. The Nords subsequently attacked the Dwemer holdings on Solstheim. Solstheim is home to an indigenous race of small, goblin-like creatures called Rieklings. Their origins are a mystery, and they have little culture of their own. The island is filled with outlaws such as witches and Reavers. Solstheim was often used as a Hunting Grounds by Hircine, who would return to the island every era as part of the Bloodmoon Prophecy. The Hunt was marked by several signs, the most significant of which being the return of werewolves to Solstheim. According to written history, Thirsk was founded early in the Third Era by a group of Skaal who left the Skaal Village to live in the wilds as true Nords. Although the existence of Solstheim was common knowledge in the Second Era and it had been generally considered a part of Skyrim at the time, Solstheim was apparently forgotten by the late Third Era, when it was rediscovered by the Imperials. [UOL 1] It was claimed as an "Imperial territory" with the building of Fort Frostmoth. The East Empire Trading Company identified the island as a rich source of ebony, and founded the mining settlement of Raven Rock in 3E 427. The Bloodmoon Prophecy was fulfilled that same year, but the Hunt was foiled by the Nerevarine. By 3E 433, the money had run out at Raven Rock, and the Nords of Skyrim launched a campaign to claim the whole of Solstheim and remove the Imperial fort. They were successful, and Solstheim was integrated into the province of Skyrim, but Fort Frostmoth remained occupied by Imperial Legion forces. During the Oblivion Crisis, no Oblivion Gates were reported to have opened on Solstheim. In 4E 0, after the destruction of Ald'ruhn, Great House Redoran sent an expedition group led by Brara Morvayn to settle in Raven Rock. The Dunmer were welcomed to Raven Rock, but the expedition was seen as an invasion by Falx Carius of Fort Frostmoth, who repeatedly wrote to the Elder Council seeking assistance in removing them from the island. Some time before 4E 5, Tel Mithryn was founded by Master Neloth of Great House Telvanni. During the Red Year of 4E 5, the eruption of Red Mountain had a devastating effect on the southern half of Solstheim. Fort Frostmoth was destroyed, leaving few Imperial guards on the island and killing General Carius. Raven Rock replaced the remaining garrison with elite members of the Redoran Guard. After only a few years, the ash from Red Mountain had transformed southern Solstheim into ashlands. The East Empire Company built a great wall known as the Bulwark to prevent Raven Rock from being buried beneath the ash. In 4E 16, the High King of Skyrim ceded control of Solstheim to Morrowind. Ostensibly a sign of compassion for the suffering Dunmer people, the act served a pragmatic political purpose: Skyrim could not deny Dunmer refugees access to Solstheim without sparking an unwanted conflict with Morrowind, which had long maintained a theoretical claim to the island, nor could it stand by and allow the Dunmer to settle its territory without losing face. By relinquishing its own claim to Solstheim, Skyrim defused the situation and emerged looking like a savior. Dunmer refugees, among them the minor House Sathil, immediately began flocking to the island to escape their destroyed homeland. 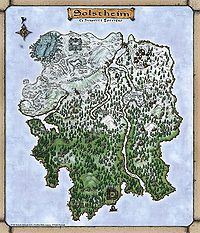 The East Empire Company was forced to turn over Raven Rock to House Redoran, and by 4E 40 the island was no longer considered part of the Empire. Some time during the Fourth Era, Neloth left Sadrith Mora to study the effects of Red Mountain's eruption at Tel Mithryn. In 4E 181, Raven Rock's ebony mine was said to have dried up, and Raven Rock fell on hard times. In truth, the mine had more ebony to offer, but sections of the mine had been sealed off by the East Empire Company after the mine had broken into Bloodskal Barrow in 4E 10. The packs of werewolves that once roamed Solstheim were mostly wiped out during the Fourth Era by encroaching werebears. In 4E 201, Miraak attempted to return to Mundus and claim Solstheim for himself. He used the power of his thu'um to bend the will of the island's inhabitants, forcing them to corrupt the island's All-Maker Stones by building shrines to worship him. The Last Dragonborn arrived on Solstheim after an assassination attempt by Miraak's cultists, and ventured into Apocrypha to defeat him. Raven Rock's mine was also reopened that year, when the lower sections were unsealed and the ruins cleared. Before the Red Year, Solstheim had a climate very similar to that of mainland Skyrim. The southern half of the island was relatively temperate, and was covered by the coniferous Hirstaang Forest. The central tundra of the island was known as the Isinfier Plains. Further north, the weather was (and remains) predominantly much colder. The barren Moesring Mountains lie to the northwestern side of the island, while the frigid Felsaad Coast lies to the northeast. The Mortrag Glacier was located along the northwestern coast, but it collapsed in 3E 427. The island has three rivers: the Harstrad, the Iggnir and the Isild. The frozen Lake Fjalding is the largest body of water on the island. Solstheim is geologically rich; although it lacks more common metals such as iron, the island is rich in gems and ebony. Local Nords also use stalhrim for various crafting purposes. Frykte Peak, Hvitkald Peak, Mortrag Peak and Mount Moesring are the four tallest mountains on the island. Other landmarks include Horker Island, Castle Karstaag and Hrothmund's Bane. The island is home to many wild beasts and dangerous creatures. Wolves and bears roam the island freely, as do deer and elk. Horkers are a common sight along the coast and waterways. Rabbits, torchbugs, mudcrabs and the indigenous Felsaad Tern also call the island home. The bristleback is a unique species of boar native to the island. Monsters such as the Grahl, Frost Giant, Spriggan and Albino Spider can be a danger to explorers. Other dangers include rieklings, Dwemer Animunculi, draugr, bonewolves and undead Dragon Priests. Local flora include holly bushes, snowberry bushes, Nirnroot, Belladonna, and the extremely rare Wolfsbane flower. The Red Year marked the beginning of a dramatic change to the geography of southern Solstheim. Following the eruption of Red Mountain, the Hirstaang Forest was transformed into ashland. The island continued to be exposed to ash storms and earthquakes long into the future. Flora and fauna native to Morrowind soon found its way to Solstheim, either through natural migration or deliberate planting by the Dunmer. Netch, Silt Striders, Ash Hoppers, Nix-Hounds, Scathecraw, Trama Root and Emperor Parasols all became commonplace in the new ashlands. The spread of ash also affected local plants such as Creep Clusters and Spiky Grass, and the destruction of the Hirstaang seemingly gave rise to the mysterious Burnt Spriggan. Falling rock from the eruption landed along the southern coast of Solstheim, scarring the land with impact craters and rubble. This volcanic rock contained Heart Stones, mysterious magical stones from deep within Red Mountain. Although their nature is largely unknown, the Heart Stones have the ability to grant life. Their presence in the ashlands led to the formation of the Ash Spawn, dangerous humanoid creatures animated by a Stone, which rise from the ash and regularly attack settlements. The Telvanni of Tel Mithryn studied the Ash Spawn and learned to control and summon them. Experimentation with Heart Stones also resulted in the creation of Ash Guardians and powerful undead who had had their hearts replaced with a Stone. ^ Official Bloodmoon map, "Solstheim, An Imperial Territory"
^ Recorded and assigned, but unimplemented Nord idle dialogue for Oblivion. "Wonder why Solstheim wasn't on the old maps... not that anyone should care."